An impressive combo at an eye-catching price. Footswitchable effects loop would have been welcome. We’re so used to Paul Reed Smith’s guitars that cost an arm and a leg that it’s often easy to forget that PRS has enjoyed massive success at the budget end of the scale, too, with its Korean-made SE range and the more recent USA-made S2 guitars. Having recently provided us with the J-MOD 100 John Mayer Signature (possibly the world’s most expensive production amp head), it’s good to see PRS redress the balance with something altogether more sensible, in the shape of its new Sonzera series, designed in Stevensville by PRS amp guru Doug Sewell and made in China. 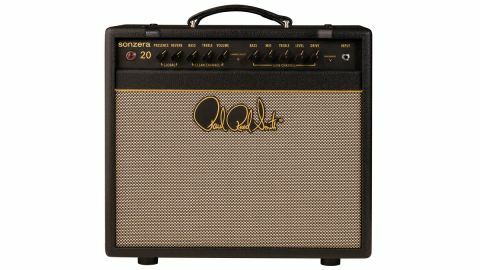 Sonzera is Brazilian Portuguese for ‘cool/awesome/frightfully good tone’ and the new range consists of a 50-watt head and combo, and this slightly more compact Sonzera 20 combo. Its cabinet is made from poplar plywood, a secret sauce for many boutique builders because of its resonant properties and reduced weight - about two-thirds the density of Baltic birch. It’s covered in black vinyl with a salt-and-pepper grille cloth topped by gold piping, behind which you’ll find a Celestion V-Type 12-inch speaker. The electronics are contained in a robust steel tray chassis, supporting two decent-sized transformers. Most components are PCB-mounted, with one large main board and smaller ones for the front and rear panel pots and sockets, connected by short ribbon cables. There are no push-on connectors: every cable connection is hand-soldered, and while the four preamp valve bases sit on the main board, the pair of 6L6 output valves are bolted to the chassis and hand-wired, two details that should significantly improve longterm reliability. This is a proper two-channel design with separate clean and gain channels. The gain channel has level and drive controls together with a bright switch and bass, mid and treble tone controls, while the clean channel offers volume, bass and treble controls. There are global controls for presence and the built-in spring reverb. At the back is a useful set of bias test points with a small adjuster screw, a pair of sockets for the series effects loop and a jack for the two-button footswitch, which toggles reverb and channel selection. The robust internals and unfussy appearance give the amp a purposeful stripped-down, ready-to-rock vibe: a player’s tool that’s meant to be taken out and gigged. We tested the Sonzera 20 with a selection of humbucking and single-coil guitars. The clean channel combines syrupy-sweet treble with a tight low-end and slightly scooped midrange for a superb take on the classic ‘blackface’-era tone, while the gain channel’s modern Plexi-inspired sounds can take you from classic rock and blues to shred, with a decent - if not overly pronounced - mid-scoop effect. What really impresses us is the lower gain settings. The first quarter of an amp’s gain control is often a dead zone, but with the drive knob on around nine o’clock, there’s a superb touch-sensitive sustain that cleans up really well from the guitar. Push the gain control higher and you get layer upon layer of harmonic-laden distortion, with a solid medium-fast response that’s great fun. Those who don’t use reverb might find themselves converted by the lush warmth of the Sonzera’s spring effect, which surrounds each note with a smooth delay and tail-off, with little or no splashiness. We’re seriously impressed with this wonderful combo, packing plenty of serious guitar tone into a compact, portable package with more than enough volume to handle most small to medium gigs. The clean channel has an addictive ‘live’ quality that’s reminiscent of some of the best small amps from the mid-60s, while the gain channel can sound vintage or bang up to date, depending on how much gain you dial in. External bias points mean you don’t have to remove the chassis every few weeks. It’s great to have an effects loop, although it could’ve been even better if it had been footswitchable, which would have brought the Sonzera very close to scoring full marks. We’d happily trade the facility to toggle reverb on and off for a footswitchable loop. Even so, it’s not a deal-breaker because the best news of all is that, thanks to offshore manufacturing, the Sonzera 20 is a PRS amp you can afford. Time to raid all your piggybanks, we think.